Management services were contracted to Canadian exploration company, Archangel Diamond Corporation, with Stephen Lay being appointed Operations Manager for their two diamond exploration joint ventures at Arkhangelsk on the Russian north-west coast. The role was to closely liaise with the Russian joint venture partners (who were also the contracted explorationists) to ensure the projects were moved forward in a way acceptable to foreign investors. During this time the Grib Pipe was discovered and the shareprice rallied from CAD 0.40 and peaked at almost CAD 5.0. 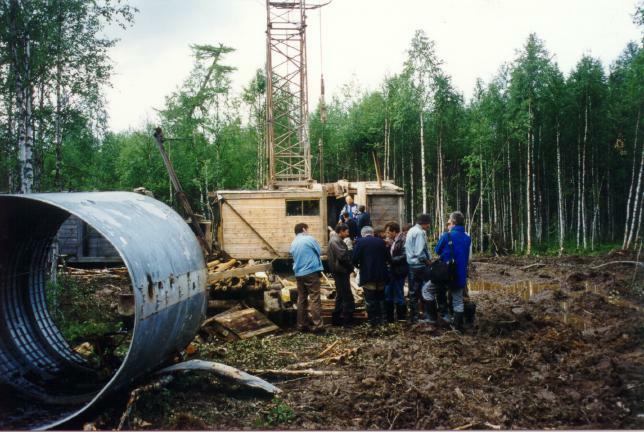 At the Verkhotina project north-east of Arkhangelsk, the local geological survey (and joint venture partner) had previously discovered eight kimberlite pipes just 30km from one of the worlds largest kimberlite fields at Lomonosova. A programme of pipe evaluation using 90mm core and 1,000mm reverse circulation drilling showed the eight pipes to be very low grade. Drilling of some 45 geophysical anomalies was also disappointing. In January 1996 Pipe 441 was discovered, later to be named the �Grib Pipe�. This pipe was discovered beneath some 50m of Quaternary cover, with no indicator minerals as tracers. This is a true testament to the abilities of the Russian geologists. All indications are that his pipe will be economic. A second joint venture with a St Petersburg company was centred on 17,500 sq km of prospective territory adjacent to Karelia. Exploration involved drilling of geophysical anomolies through up to 20m of Quaternary cover. Drill target selection was supported by geochemistry. No kimberlites were found, however extremely anomolous counts of micro-diamonds were found in the Quaternary. Site of the Grib Pipe, soon after discovery.